I need to get this page blank. How do I remove these lead pencil inscriptions completely? 1. Turn your pencil around. 2. Apply the rubber end to the inscribed surface. 3. Rub vigorously until your pencil markings fade away to satisfaction. Finding the right eraser has been compared to "fighting your way through [a] jungle". There are pink pearl erasers, vinyl erasers, kneaded rubber erasers, art gum erasers, electric erasers, white paint (Pro White / White-out), eraser shields - all vary depending on your objective and each requiring a different erasing action depending on the surface and inscription they are applied to. Kneaded Eraser Can be shaped to need. Absorbs pencil marks rather than creating particles of rubber - that's right: no residue! Soft rubber Use by repeatedly dabbing the surface to be erased. Art Gum Eraser Useful for erasing large areas of pencil markings without damaging the paper. Crumbles with use into residue that must be brushed away with care. Soft, coarse rubber Use by rubbing surface. Mars Plastic Durable, effective on hard drawn lines, and with controlled residue. Formula of synthetic rubber (vinyl): polyvinyl chloride, chalk/kaolin, pigment, softening agent (paraffin oil?) (src) Use by rubbing surface. Eraser Tip for pencils Conveniently located on back of pencils. Formula of synthetic rubber (vinyl): thermoplastic elastomere, chalk/pumice/glass powder, color pigments, paraffin oil for softening. Use by rubbing surface. 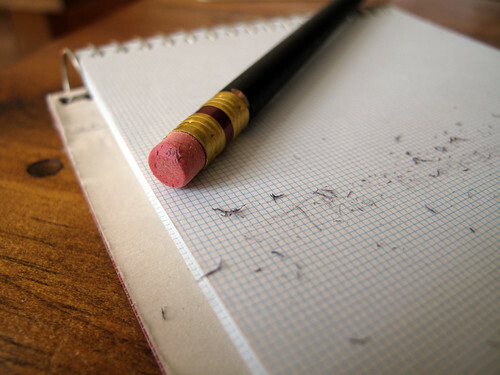 pencil talk's post on erasers is recommended reading on the finer points of pencil erasing. Also raises the interesting observation that there are certain paper types that afford improved erasability. From pencil talk's informal research, Mars Plastic is the most effective at completely erasing pencil marks.